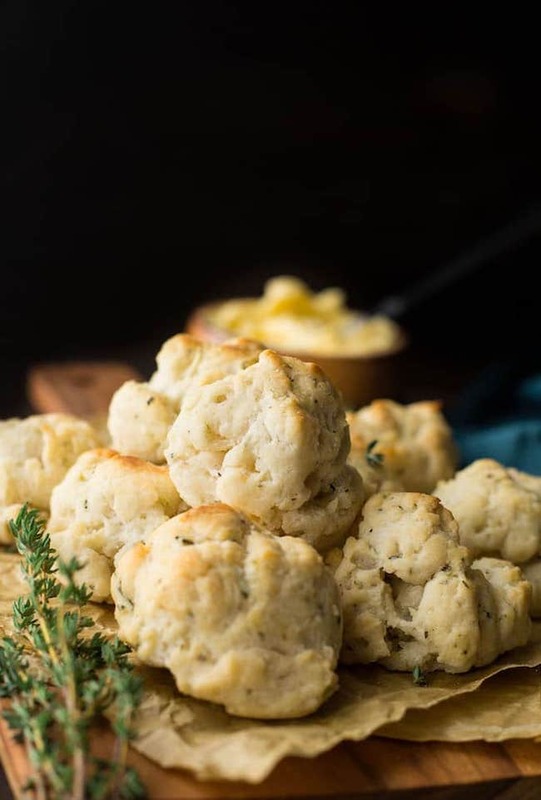 Vegan & gluten free biscuits packed with herbs & spices – only nine ingredients + easy to make! 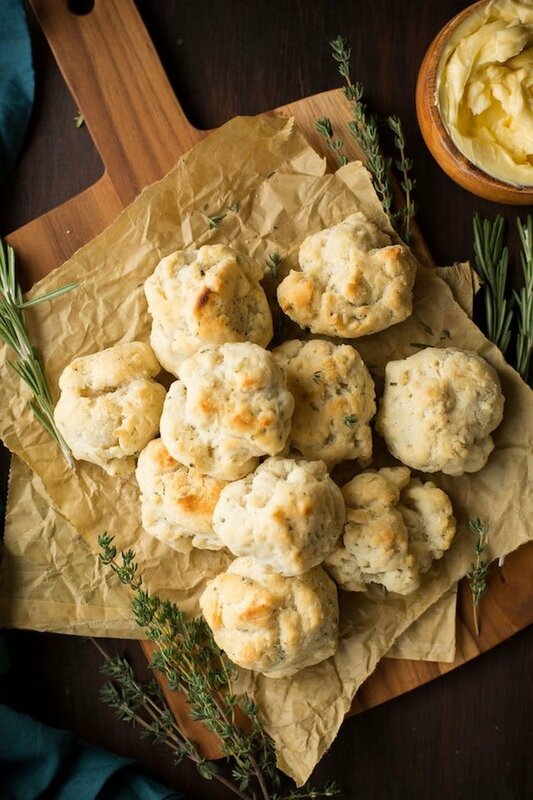 But not just any biscuits – vegan + gluten free biscuits packed with fresh herbs. 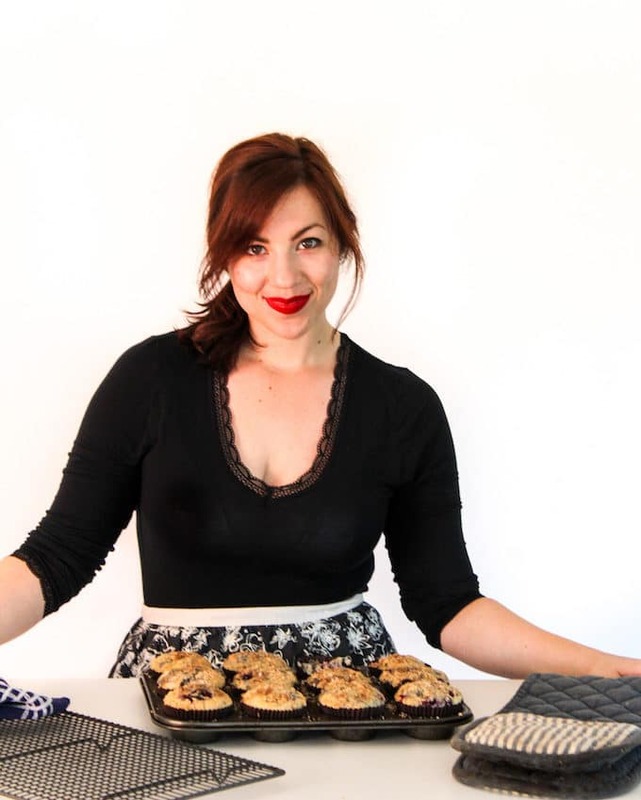 These biscuits are actually based on the recipe for my gluten free vegan blueberry scones. Those scones have been getting a lot of love in the past few months so I decided to play around with the recipe a little lore to see what else could be done with them. These biscuits are pretty simple to make – start out by mixing together your dry ingredients in a bowl until well combined. Cut in your coconut oil – it should be soft, but not melted. Mix it in until you’ve got a powdery, sandy dough and then mix in your coconut milk. I recommend popping the dough in the fridge for at least 15 minutes before baking so that the coconut oil has time to firm up before going in the oven – this is especially important if you live in a warm place where coconut oil melts quickly. Feel free to mix and match the herbs in this recipe depending on what you like/have on hand. Throw in some garlic powder, add in some vegan parmesan – it’s a pretty flexible recipe so play around with it to make it your own. These would go well alongside a bowl of veggie chili or fresh, hot soup. They’re also a great Thanksgiving and Christmas side – personally I’m looking forward to loading these up with all the holiday leftovers – piling on the gravy, stuffing – everything! 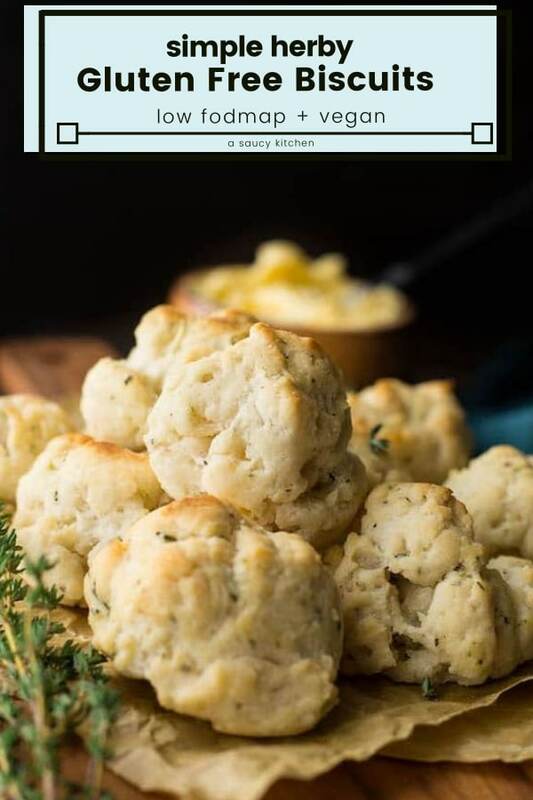 Don’t forget to tag @asaucykitchen if you try these Gluten Free Biscuits! You can also post your pictures to my facebook page! 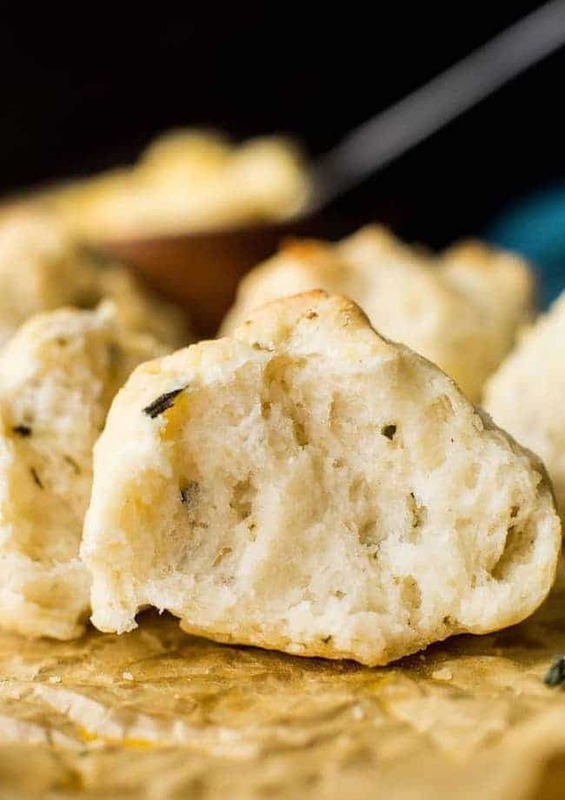 Vegan & gluten free biscuits packed with herbs & spices - only nine ingredients + easy to make! Whisk together the flour, baking powder, salt and herbs (and nutritional yeast if using) together in a large mixing bowl and combine. Add the coconut milk to the bowl and stir until a soft dough forms. Place the dough in the fridge for at least 15 minutes. Don't skip this step - the coconut oil needs to harden up so the biscuits don't spread too much while baking. Preheat the oven to 400°F/200°C. When you're ready to bake take the dough out of the fridge. Scoop out heaping tablespoons of the dough and drop them on to your baking pan. Leave at least 2 inches in between each dough ball so they have room to grow. Bake for 20-22 minutes until the biscuits have risen and are lightly golden in colour. These best enjoyed fresh/warm. Heat these up in the microwave or the oven before serving if you plan on making these in advance. I don't recommend trying to shape these biscuits - they don't come out as soft/fluffy when you try to form them. Awesome recipe. I plan to make for BF later. Thanks for sharing!! Can these be rolled and cut rather than dropped? These were fabulous! My husband was diagnosed coeliac recently and he’s been missing his biscuits. Thankfully he loved these so I don’t have to worry about finding a new recipe anymore. I’m so glad you guys liked them! Thanks so much for coming back to share! Hi! Can this be made with regular flour instead? If I use regular four, would I leave anything out? I think so! They’re based off of my blueberry scone recipe which was adapted from a Serious Eats recipe that wasn’t originally gluten free so I think it would translate well! Can these be made with butter and cow milk instead? I haven’t tried it with dairy but I’m almost positive that that shouldn’t be a problem!